1. What was the "Revolution of 1800"? In 1800, Thomas Jefferson, from the Democratic-Republican party, ran against Adams for the upcoming election. The presidential election became known as the Revolution of 1800 because, contrary to its name, it was the first peaceful change in power. Excellent. Will put in model answers! 2. If you were the president, would you have approved the Louisiana Purchase? Explain. Absolutely! Without that large piece of land, we'd lose that much more resources, and have one more border to protect. And whose knows who would have bought the land if we hadn't. It could have been anyone. Also, we would still have the same number of immigrants flowing into our country and nowhere to put them. It was without a doubt correct to approve the Louisiana purchase. Good point, although I don't think space is so tight! 3. Identify a cause of the War of 1812. It started when some members of Congress accused it of starting Indian attacks against the United States. As an insult to injury, the English came and burnt down the Capitol Building and White House. Good, but the burning occurred after the war started, and hence was not a cause. (Minus 1). 4. Describe what you like most about the Monroe Administration. I think that the most important thing about the Monroe Administration was the "Monroe Doctrine", established in 1823. It stated that Europe could not add any new colonies in the Americas because Europe's systems are so different from those in America. 5. Explain what is meant by "Jacksonian Democracy." It is called a 'Democracy' because he won the election by a large amount of votes. While the middle class and lower class loved him, the upper class hated him because of his lowly birth (he was born in a log cabin). This election is an excellent example of Democracy because the majority of the people voted for Andrew Jackson, demonstrating that the people had the 'power'. 6. Explain what the Marshall Court is known for. They are best known the expansion of the Supreme Court's power. This cartoon represents the Treaty of Ghent. The bull is England, trying to create peace between all of them. The weaselly looking thing with the black fur and foxy face is supposed to be a black bear and represents Russia. The bear is trying to friend the lady. The Lady is holding an American Flag and therefore represents America. I believe it was made around 1813. 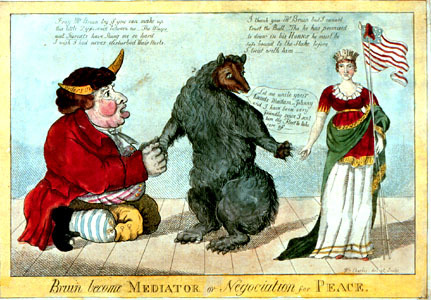 The cartoonist, William Charles, was probably American (not only because he made the bull appear hideous and the bear look like a weasel) because the bull said, "The Wasps and Hornets have Stung me so hard I wish I had never disturbed their Nests," thereby causing the bull to imply that England shouldn't have entered into war with America at all. This page was last modified on 27 June 2016, at 12:54.